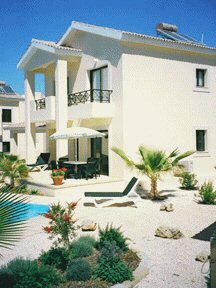 The villa is situated in peaceful countryside in the prestigious 5 star Secret Valley Golf Resort. It is light and airy with its own private 10m x 5m swimming pool and fully landscaped garden with fan palms.It is sold fully furnished with full air conditioning and is ready for immediate occupation.The villa has three bedrooms, each with a private balcony with rural and distant sea views. The villa enjoys a quiet rural location within easy reach of all amenities - 3 minutes from the golf course, 10 minutes from the airport and Aphrodite Hills and 15 minutes from Paphos town centre. Several local villages with tavernas serving traditional Cypriot food and wines are also within easy driving distance.The villa was completed in November 2004 and has never been occupied, we consider this as a new property rather than a re-sale.